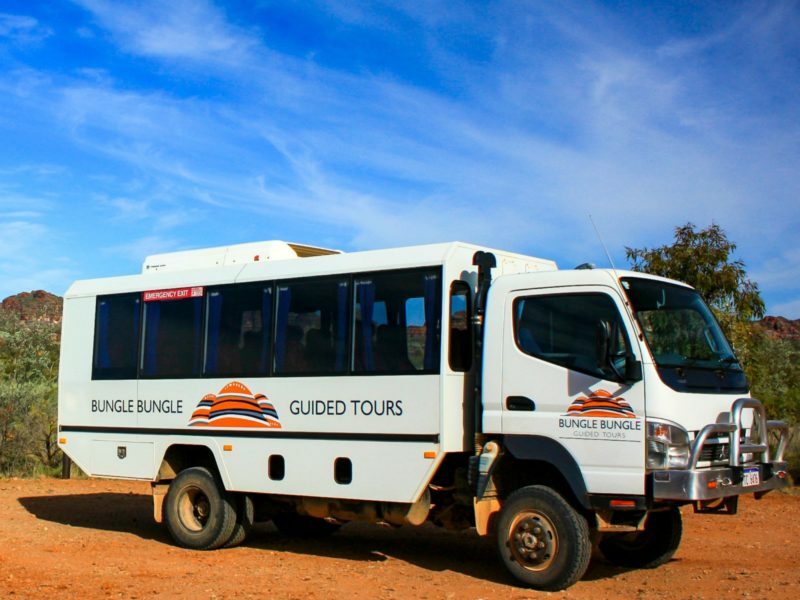 Bungle Bungle Guided Tours offer a unique experience, providing guided walking tours with an Aboriginal perspective of the World Heritage-listed Purnululu National Park. 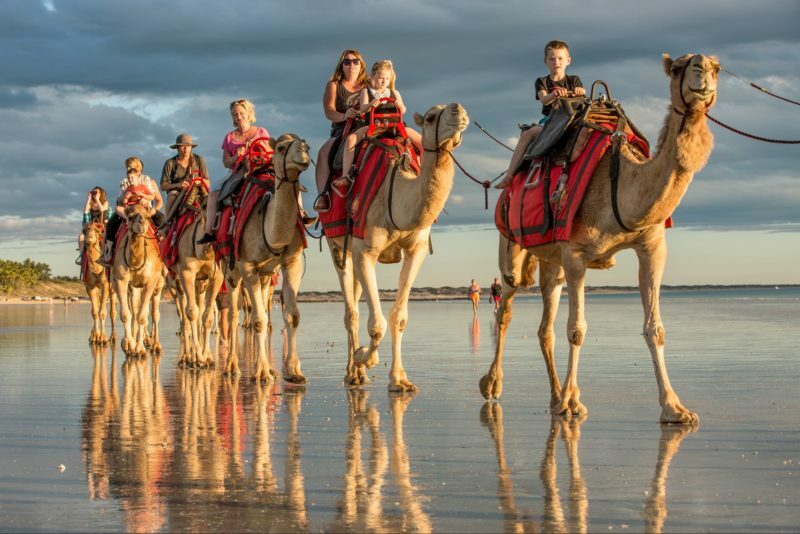 Locally-owned, they aim to employ local Aboriginal guides who share their culture with visitors whilst on tour. 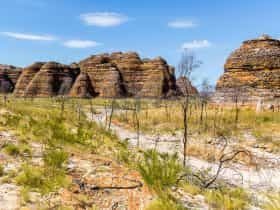 One of only 12 UNESCO Natural World-Heritage sites in Australia, Purnululu National Park covers almost 240,000 hectares of remote wilderness and includes the Bungle Bungle Range, a spectacular landscape of sculptured rocks and sandstone towers. Your local guide will take you back to a time where the Aboriginal people lived here for some 40,000 years. Learn about bush-tucker, Aboriginal customs and the many reasons why Purnululu is World Heritage-listed. Immerse yourself in the spirit of this ancient place. Flying by plane from Kununurra in air-conditioned comfort, with high wings offering spectacular panoramic views. By helicopter the views are close-up and you can land en-route to swim in waterholes. Fly over Lake Kununurra, the Ord Irrigation Area, Lake Argyle, the Carr Boyd and Osmand Ranges. Flying in from Warmun via helicopter offers close-up views of the stunning Osmand Range and the famous orange and black striped sandstone domes in the Bungle Bungle. In Purnululu National Park meet your guide at the HeliSpirit for a short drive to the start of the walk. The Domes Walk will leave you filled with amazement as you walk amongst the famous eroded towers and black and orange banded beehive structures. Walk into Cathedral Gorge, where the towering cliffs open up to form a space with awe-inspiring natural acoustics. 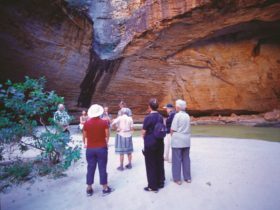 Walk along the bed of Piccaninny Creek and learn about the Kimberley climate, the six seasons and unique flora and fauna so important to the traditional custodians of the land. Your guide will take you into Cathedral Gorge, where the towering cliffs open up to form a space with awe-inspiring natural acoustics. Walk along the bed of Piccaninny Creek, which flows only in the monsoon waterfall season. Learn about the Kimberley climate, the six seasons and unique flora and fauna so important to the traditional custodians of the land. A 65-minute drive takes you northwards along the Western Wall of the Bungle Bungle Range. You’ll leave the sandstone striped domes behind you to view conglomerate structure with deep cutting rifts. A rocky path leads your walk into Echidna Chasm, which narrows until it is just two shoulders width apart. Gazing skywards to the bright blue sky, the orange towering walls look as if they are lit from within. Livistona palm trees cling to the vertical sides. A high level of mobility is required for this one-and-a-half hour walk as it includes climbing over boulders and walking up staircases to viewing platforms at the end of the chasm. Piccaninny Gorge has only been explored by very few people as access is only by foot (three-day hike) or by helicopter on this tour. The untouched rugged gorge seems prehistoric and is spectacular. Meet your guide and then board a helicopter to fly over the Bungle Bungle to ‘Y’ Gorge before soaring across the top of the range to the mouth of spectacular Piccaninny Gorge where you’ll land. This enormous gorge spreads into five “fingers” as it cuts through the range. 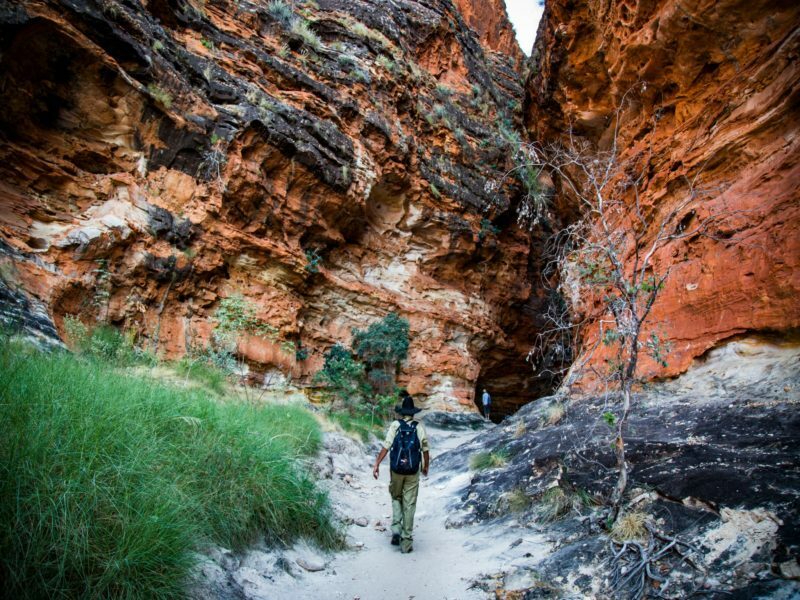 Your guide will lead the hike into the gorge and tell you about the area’s cultural significance to the Aboriginal people and its unique history, which led to the World Heritage-listing of Purnululu. This hike has no designated track which means you and your guide are likely to be choosing your own track throughout the day. Finding new things on your hike is common, as the path you choose to walk will be one that only a few feet have trodden. The hike is up to 10 kilometres return and requires a high level of fitness and mobility. The rocky creek bed of Piccaninny Gorge is classed as a level five walk.